The Seapower Platform’s excellent power performance has already been proven. Power curves and site dependent Power matrices are available and these have been developed through a measured iterative design/build/measure/redesign process which includes numerical analyses and wave laboratory testing, and real sea deployment. Results have been validated by independent experts and are considered game-changing in comparison with published results from all other known wave energy devices. Seapower are happy to share results with academic researchers, and our collaborators. The Seapower Platform can extract energy from ocean waves efficiently, safely and with low maintenance and maximum economic return. The platform, fundamentally a hinged wave attenuator, is made up of hollow pontoons making up two separate bodies. The low cost and long lifetime of the simple hull structures is a major contributor to the cost effectiveness of the device. The pontoon properties and their spacing are carefully sized to maximise average wave power capture for a site. The internationally patented device captures energy in by reacting to long prevailing wavelengths for high resource sites. This explains the performance advantage over devices such as point absorbers and OWCs which fail to exploit all the available incident wave power, and fail to target higher resource locations. The simplicity of the design (there is only one hinge) made up of two oscillating bodies, means that it is more cost effective than any other known attenuator-type device. The platform, although of large overall displacement, has a shallow draught. This makes it easy to build, launch, deploy, recover, and decommission using local infrastructure. It also has a low visual profile above the waterline making the device much less obtrusive than offshore wind turbines. Seapower Platforms will, for power capture reasons, be located between 10 and 30 km in offshore. The device is slack-moored and is intended to be designed as part of a 100MW array of units offshore. The overall environmental impact is minimal. The PTO system for the Seapower Platforms are mounted either on the deck of the main body or on the hinge of the unit. Each system is designed to be easily accessible (above waterline) for maintenance or replacement. As the platform has a good roll stability safe access is permissible with wide flat deck areas makes for easy and safe mooring operations and storage of plant equipment etc. Two separate PTO streams are being developed and these are described briefly below. Each PTO stream is suited to end-user requirement whether this be electricity, energy storage for pumped hydro plants, desalination or land irrigation. USE: Specifically for either Pumped Energy Storage facilities or for local seawater desalination. DESCRIPTION: The Seapower C-Pumps are highly efficient, double acting, reciprocating pumps designed to pump large quantities of raw seawater at high pressures and can be used with many WEC types. This hydraulic seawater-based system is capable of withstanding extreme forces and low speeds offered by the WEC system. The pumps use a specialised surface coating for abrasion and erosion protection against the sea water and its contaminants. The locations, sizes, quantities and pressure ratings of the pumps are carefully selected to optimise water delivery and power capture output, and importantly to do so at the lowest LCOE levels for the WEC. This PTO may be used to either convert seawater into freshwater, or to directly deliver seawater to elevated storage reservoirs. Such reservoirs, while analogous to present day PHS units, are much lower cost because there is no technical requirement for low level pump/turbine caverns and associated drilled access shafts etc. USE: Specifically for grid-connected direct electricity generation from a deep water site to shore. DESCRIPTION: In partnership with Limerick Wave Ltd., a novel mechanical PTO module is being developed for the Seapower Platform. It consists of a simple but robust gearing arrangement which allows unlimited stroke angles (i.e. there is no end-stop problem or limit). The module is fully enclosed and naturally lubricated within a nacelle. Two one-way freewheeling bearings ensures that the direct drive generator’s rotor rotates in one direction while the combination of ‘upfront mechanical rectification’ in the transmission and power electronics provides effective power smoothing and economical power directly into the grid. Sea Power Ltd., in conjunction with partners are developing the application of low speed, direct drive power generation, similar to that deployed in more recently developed “low RPM” wind turbines. The concept is to utilise wind turbine technology for good supply chain economics and develop a low LCOE solution for the WEC. Gearing plays a large role in reducing the extreme torques and bringing the airgap speeds high enough for efficiency. Two such PTO modules, rated at ~500 kWe, are envisaged for on board the Seapower Platform operating at a full scale North Atlantic site. The PTO module is currently at TRL2/3 with R&D focusing on the large scale commercial unit. 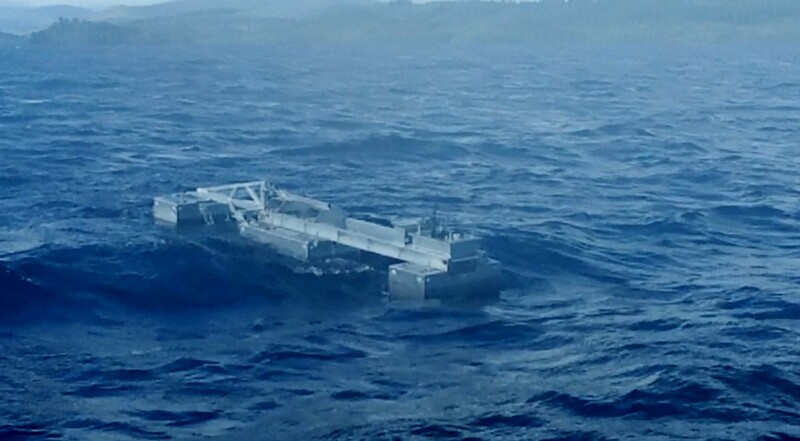 It uses modular PTO components which could be repaired or replaced at sea by accessing a large flat deck, although planned recovery is a more likely strategy. Long Lifetime: 25 to 30 years per unit, with bearing replacement every 3 years, and PTO replacement every 10 years.